The dreaded “J” word! Although our beaches here on the Costa del Sol are generally safe for swimming, we sometimes receive visits from unwelcome visitors: Jellyfish. Under certain conditions, usually after heavy easterly winds and when the sea temperature is warmer than average, these slippery creatures head towards the shoreline and cause havoc amongst swimmers. They aren’t particularly dangerous; however, their sting can be painful and causes discomfort for their unfortunate victim. They are usually difficult to spot in the water and bathers get stung by coming into contact with the jellyfish’s tentacles. 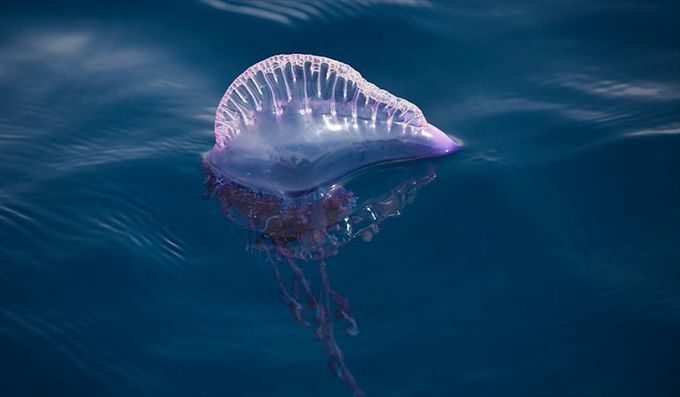 UPDATE: During the spring and early summer of 2018 the Costa del Sol – and most of the Mediterranean coastline has been ‘invaded’ by the dreaded and dangerous Portuguese Manowar jellyfish (see image below). The persistent westerly winds and currents from the Atlantic have brought these slimy creatures to our shores resulting in the closing of many beaches. Unlike their more common ‘cousins’, this species isn’t common in the Mediterranean; however, their sting causes extreme pain and can cause respiratory problems and even heart failure. The Portuguese Manowar is easily spotted as it looks like a purple/blue coloured balloon which floats on the surface of the water. Below the surface lie the long tentacles which are so dangerous. If you have kids, beware of these jellyfish being washed up on the shore; their bright colour makes them ideal targets for inquisitive young fingers and the sting is just as lethal when they are dead and washed up on the shore. Symptoms usually remit after a few hours; however, in some cases, if a patient is allergic to the sting or suffers other illnesses, symptoms can be more severe and medical treatment may be necessary. Apply cold over the sting; make sure you don’t apply ice directly on the injury, rap it up in a cloth or towel. Do this for about 15 minutes. Remove any remains of a jellyfish tentacle on the skin; make sure you don’t use your bare hands. Use gloves or tweezers or even a credit card. It is standard procedure to apply some form of antihistamine; we recommend you go to the chemist or our hotel doctor and explain what has happened so that they can subscribe adequate treatment. If the pain is very severe or the victim’s state worsens, go to the nearest medical centre as soon as possible. Do not rub the sting with a towel or with sand; this will just make the injury worse. Don’t rub sand on the wound. You may have seen this in movies but it’s not a good idea. Don’t use soap to clean the area where you’ve been stung. Don’t rub alcohol on the wound. Do not urinate on the wound. All the above ‘remedies’ only result in the spreading of the venom over the skin and increases the risk of infection (especially using sand or urine). Another liquid often used to calm the pain of a sting is vinegar. Although this can be effective in treating the stings of some species, it can have adverse effects with others like the Portuguese Manowar. We recommend you stick to the recommended method outlined above. 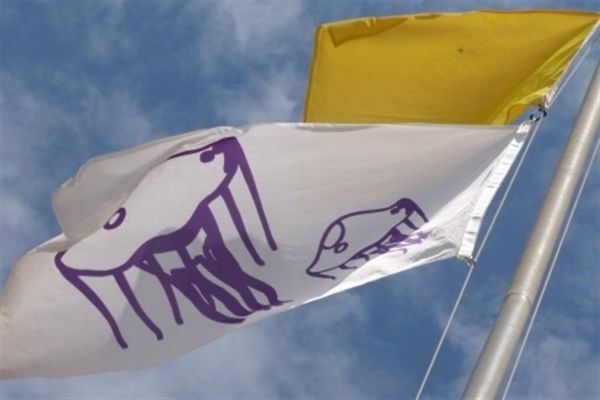 1) Look out for flags like the one in the image above. If the lifeguards have put this flag up it means that there are jellyfish in the water and there is a risk of getting stung. 2) Jellyfish will often get washed up on the shore; make sure you don’t touch them and be careful with kids as their inquisitiveness means they are prone to being stung when playing on the shore. Releases inhibitors which prevent the unleashing of stinging darts. 4) If you are staying on the Costa del Sol, there is a Jellyfish mobile app you can download for your smartphone which lets you know the state of all the beaches on the coast and whether or not there are any jellyfish in their waters. Well, you are now equipped to deal with these annoying creatures which can potentially ruin a pleasant afternoon on the beach. Luckily these jellyfish rarely appear, but at least you’ll know what to do if you do happen to come across them on your travels! Thanks for the jellyfish tips. 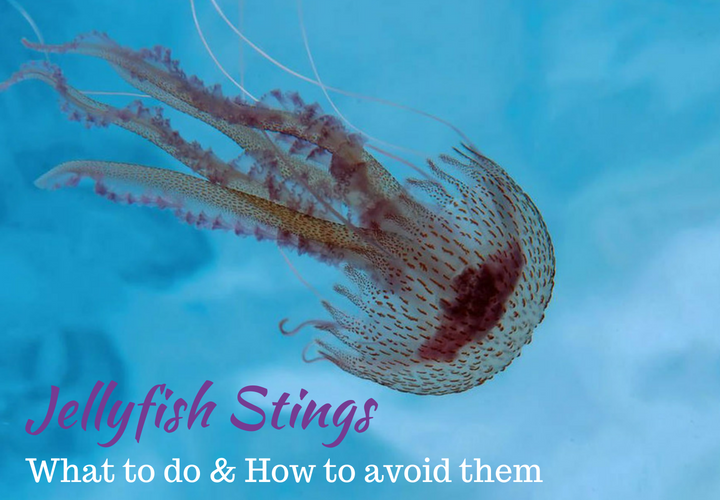 If stung they can be super painful and there are so many myths as to how to treat them. If there are signs saying that jellyfish or other stingers are around at the moment its best to stay out of the water. We did a post of bluebottles that frequent Australian beaches. I was stung on Luna beach yesterday morning just along from Calahonda. The pain is excutiating for around 2 hours. Lifeguards treated me and said how rare it was they said how unlucky I was! Chemist provided antihistamine cream Neosayomol which actually has picture of Jelly fish or Medusas in Spanish on the front. Sorry to hear that Aileen… sounds painful! Thanks for the recommendation about the cream. I got bitten by this exact jelly fish thats shown on the picture i went to a pharmacy and bought some cream she said that the cream will make the thornes go away is that true? and one more qeustion after how much time can you swim in fresh water or something like a pool whith hlorine? Hi John, yes, they are small but quite nasty! I’m afraid we don’t have an answer to your question but if the chemist said that we would assume it’s true.